Now that all manner of Twitter clients have perched on the iPhone’s software branches, the Mac desktop market is aflutter with applications for the social networking service. 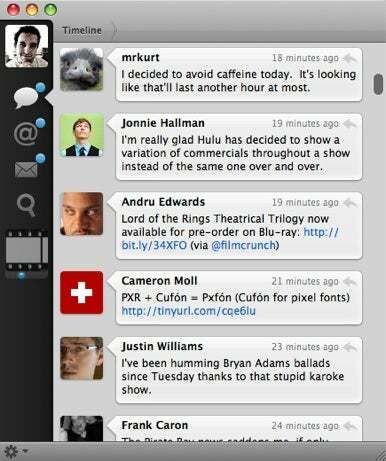 Tweetie is a new OS X Twitter client from atebits (makers of the iPhone app of the same name) that's due to be released this coming Monday. But why wait until then? We have a first look for you now. 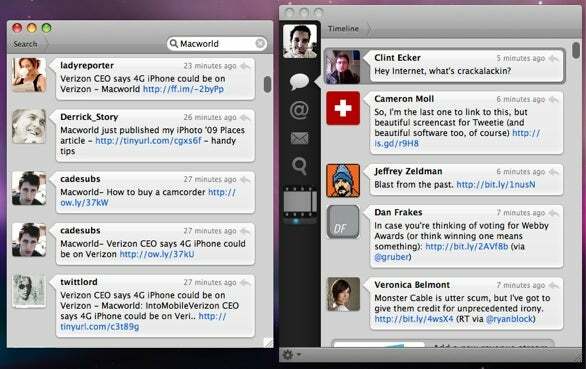 Tweetie for the Mac presents a compact window for reading tweets, replies and mentions, direct messages, and searching the entire Twitterverse (yes, apparently that is a word now). 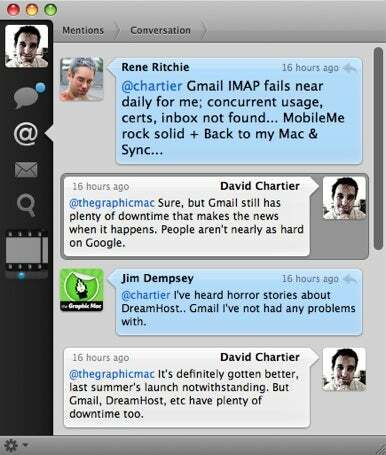 Tweets are displayed in an iChat-like interface, regardless of whether you are viewing your friends’ timeline or a reply chain. The program has support for multiple accounts and most operations, like creating a new tweet or switching between timelines, are easily accessible via keyboard shortcuts. Tweetie offers a number of features that let you use Twitter more quickly and—dare I say it—perhaps even more productively. For instance, the new tweet window (accessible by a customizable, universal keyboard shortcut) is separate from Tweetie’s window. This flexibility allows you to close the main Tweetie window, removing the distractions of your friends’ tweets, while keeping the program running, so that you can continue to publish your 140-character musings. The posting window even has a drop-down menu for switching between accounts for those who post under different names. When it comes to photos, you can simply drag pictures from the Finder onto Tweetie’s posting window to automatically upload and share them via your choice of Twitter-friendly image-sharing services. A bookmarklet will also let you quickly tweet a Web link from your browser with a handful of Twitter-friendly link services, whose URL-shortening abilities are available via, yes, a keyboard shortcut. Tweetie is also quite adept at drilling through reply chains, viewing user profiles, and searching Twitter. Clicking through reply chains will display a breadcrumb trail at the top of the window so you can easily trace your way back, and you can click through to other users and replies until you're blue in the face. Clicking users’ icon displays a page with their latest posts, mentions, favorite tweets, and their profile and follower stats. Tweetie sports a healthy dose of visual flair without trying to get you drunk on whooshing around. Clicking between your friends’ tweet list, mentions, and direct messages, for instance, will quickly slide the current list up or down to make way for the new one. Clicking the icon of a second account in the left sidebar will slide it up to the top of the window and reveal its own buttons for mentions and direct messages. Double-clicking a reply will employ a fancy fade-zoom, revealing a list of all the back-and-forth tweets by participants. For a functional UI finish, small blue badges appear next to the timeline, mentions, and direct message sections to inform you of new messages. They also appear below the icons for your other accounts, so you know whether it's worth switching over. If mining the Twitter community's thoughts on current events, a product, or other trends is your game, searches can be separated into their own window for persistency’s sake. However, Tweetie does not yet offer much in the way of the advanced search options at search.twitter.com, though you can manually use operators like “from:” and hashtags. Loren Brichter, the developer behind atebits, has not yet warmed up to the popular custom groups feature that other clients like TweetDeck employ. As to whether groups will arrive eventually in Tweetie, Brichter only says that “'Maybe' is the best answer I can give right now. I personally think that client-side grouping is not a robust solution.” Instead, he recommends that users leverage Tweetie’s support for multiple accounts, since that's supported by the service. Still, this is not exactly a great solution for users who want to filter the users they already follow into, say, one group for news organizations and another for notable users who tweet about a specific topic or industry without having to maintain more than one account. When Tweetie is released to the public on Monday, Brichter will offer it in both a free, ad-supported version (featuring infrequent ads from fusionads.net) and a paid version for $14.95. I’ve been beta-testing Tweetie for the Mac for a couple weeks now, and it almost immediately became my default Twitter client. Tweetie is fast, offers a great set of features that let users tweet quickly and get back to what they’re doing, and the visual flair is fun and refreshing.